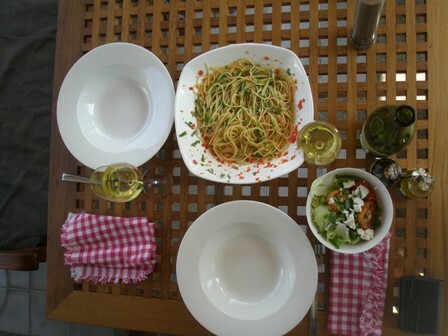 My farewell meal before leaving my Bangkok home was “pasta”. 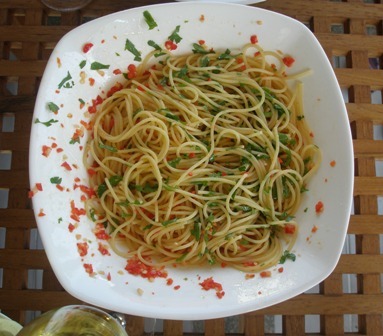 Since there was not much time between the decision to get on the plane and the packing of suitcases, it needed to be a fast one: ‘spaghetti alio e olio’ with some ‘peperoncini’ was the choice. A delicious meal on our terrace, very civilized, a moment of reflection and introspection before the outer world was allowed to swallow me again. The drink of choice was our new “house wine”, a ‘2007, The Bushman’s Gully Chardonnay’, a simple but straight forward white, mass produced wine which sells at about 8 EURO/bottle which is not exactly cheap and much too expensive for a “house wine” for every day consumption. But we are in Thailand and not in some wine drinkers heaven. This entry was posted on Wednesday, December 3rd, 2008 at 1:50 pm and is filed under food and wine. You can follow any responses to this entry through the RSS 2.0 feed. You can leave a response, or trackback from your own site.